East social studies teacher Scott Mindel believes that veterans are not given the respect they deserve nationwide. Compelled by this, he has constructed a Veterans Tribute Wall and video. 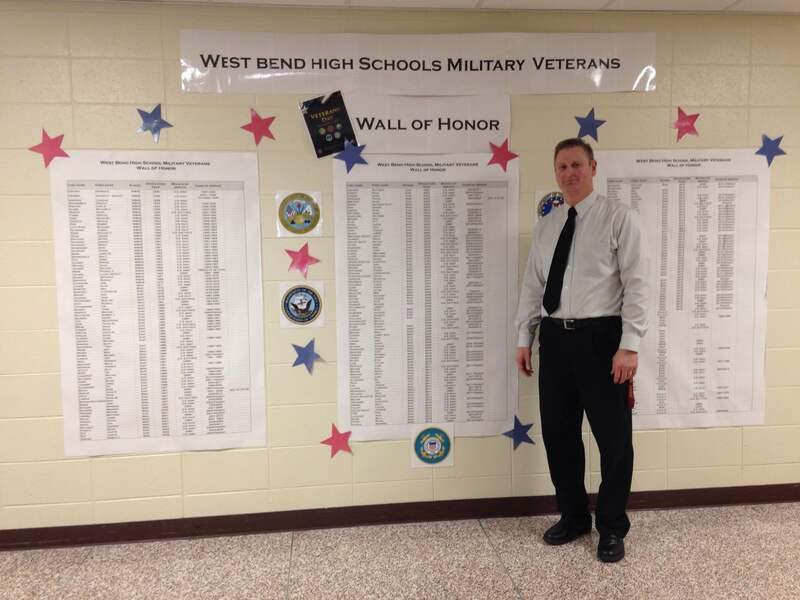 The Veterans Tribute Wall is filled with the names of approximately 325 veterans who have also been either students or staff members at the West Bend High Schools. Mindel says that there are still countless more names to be found. The Veterans Tribute video features around 170 pictures, but Mindel is still looking for more. “I would like to get all of the names and all of the pictures to match those names,” Mindel said. He is even working with the Historical Society to find the names of local veterans from World Wars I and II. Mindel has been working on these projects since the beginning of the school year. He wants students who are considering joining the military to know that they can talk to staff members. Mindel believes that students will appreciate talking to somebody who will give them an honest answer as to what life in the military is like, as opposed to a guidance counselor or a recruiter. “[The Veterans Tribute Wall and video] is such a great start. As a veteran myself, to see that recognition means a lot,” said Bill Greymont, head principal and Army veteran. Greymont was stationed at Camp Navistar, 200 meters from the Iraq border in Kuwait, from July 2006 until July 2007. This recognition doesn’t end with the wall or the video. On Veterans Day, the Fallen Soldiers table sat in the cafeterias, and “Taps” played on the overhead speakers. “The nice thing about the wall is that it’s going to carry on every day. It’s not just about Veterans Day. It’s every day,” said Tony Zappia, West social studies teacher. Zappia invites anywhere from 15 to 20 veteran guest speakers to his War and Peace class every semester. Most veterans are from Iraq and Afghanistan, but some are from Vietnam or even World War II. “My goal is that at the end of class if they see that man walking around Pick ‘n Save with that USS Wisconsin hat on, they go up to him and say ‘thank you for your service’, they appreciate what he did. It’s not just a token ‘thank you for your service’,” Zappia said. 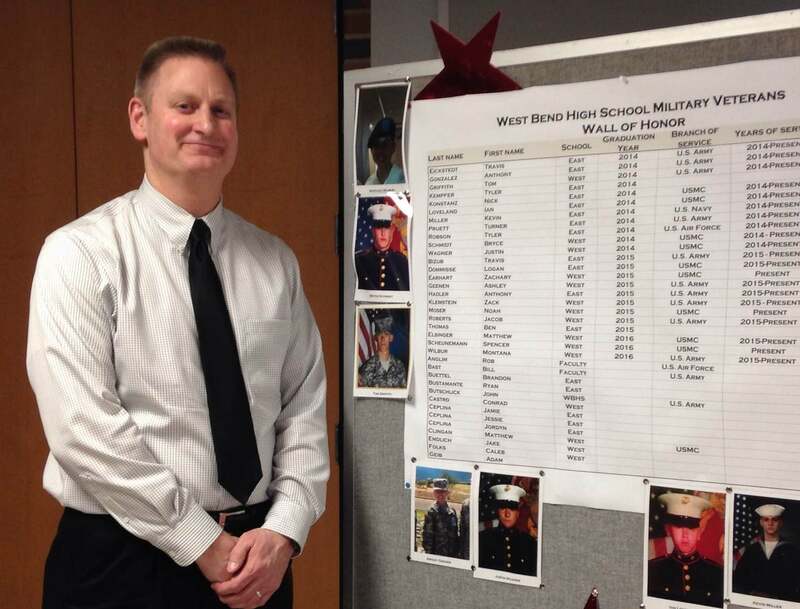 “I don’t think we as a school, as a high school especially, have done a great job at recognizing those people that have once been in our hallways that have gone on to serve, some of which have lost their lives as a result of their service. So I thought this was at least one way to recognize and honor their service,” Mindel said. Mindel has several family members who have served in the armed forces. Paul Barry, an East senior, explained why he went to training for the army the summer after his junior year, which is earlier than usual. “I wasn’t the most disciplined kid, so I thought it would change my school life. It matured me by like 20 years. It was a good change. It helped me grow up and see the world, basically. It’s not just West Bend. It made me a lot more appreciative of everything,” Barry said.